Located near the intersection of Preston Hwy and Fern Valley Rd a few minutes east of I-65, Extra Space Storage serves Louisville residents Lynnview, Knopp, Heritage Creek, and Spring Hill. Locals will recognize our facility next to Sam's Club near Walgreens. Do you need a storage unit close to the airport? Extra Space Storage is about 5.8 miles from Louisville International Airport, so we're an accessible option for residents and travelers. Extra Space Storage on Preston Hwy offers a variety of storage units, climate-controlled storage, vehicle storage, and exceptional security. We're your go-to solution in Louisville! With unit sizes ranging from 5x5 to 30x24 and convenient features like climate control, drive-up access, and more, it's easy to find the perfect storage unit for your needs at our Louisville storage facility! The safety of our customers and their belongings is our top priority. That's why have security features like 24-hour video surveillance, electronic gate access, and an on-site resident manager. Protect your most sensitive belongings from Louisville's extreme heat and cold with climate control. This feature keeps your unit safely between 55 and 80 degrees year-round. Climate-controlled units come in sizes 5x5 to 10x20. 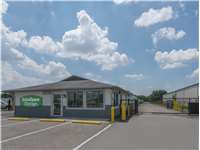 Need to store a car, motorcycle, boat, or RV in Louisville? Extra Space Storage offers 10x10 to 30x24 enclosed drive-up units and 8x5 to 10x40 outdoor parking spaces to handle vehicles of all sizes. When you rent with Extra Space Storage, you know you're getting the best. Our friendly, professional staff maintains a clean, secure facility at all times and is more than happy to help with whatever you need. We go above and beyond to deliver excellent service. Contact us today to reserve a storage unit in Louisville! Nice price for what I need. Super friendly staff and very accommodating. Helped my husband and I with the perfect unit. Absolutely happy w the professionalism, friendliness and cleanliness of this location. Prices are competitive w other storage in the area. The manager Mathew was very pleasant and helpful in every way on my visit. The rates are so very reasonable too. But the most important thing about exp was dealing with Mathew. He's a real asset to the company. Yam well pleased with Extra Storage. They are very professional, courtious,, prompt and very polite. They type of people that anyone would want to deal with. When you go online to make a payment even though it has your account pulled up and will allow you to update your personal information it states that you have no account? To make it even more frustrating , you are taken when you select to make payment to what looks like a payment option screen. This takes you automatically to easy pay but should you chose one time payment absolutely NOTHING happens. Broady was a very helpful professional staff manager. The unit was for a short period temporarily during a divorce. If I had been a longer time customer I would suggest better doors from drainage and rain water issues. The facility always seemed secure good lighting and clean. From the time I called them to ask about pricing until I loaded all my things into the storage unit, everything was great. Quick service. Friendly management. Thorough elaboration of what is expected and good rates on coverage if damaged. Sweet! Good respectable hours of operation. This facility is one of the best one I have ever us and I tell you I have used a lot of them. The manager was very frendly and the staff was great!! I have no compaints what so ever. The units and grounds are keeped clean. the facility at the second location was good except for getting around the corner in the back of the buildings because of limited space and a trench. the employees are nice and very informative and always ready to help out. Randy was an excellent help to me. I was in Virginia getting ready to move to Louisville and he was able to assist me in getting my contract completed in VA so I could move in my unit on a Sunday when the office is closed. This was a tremendious help to me considering that I just came from out of State and only had help on a Sunday. I had reserved storage at another facility but got lost trying to find it. I saw Extra Storage and turned in, and wound up getting a space here instead for about 50 dollars cheaper per month ! The manager was super friendly and helpful ! Lucky i got lost ! this has been the only company i have rented from and they are great. they have alot of locations. people are friendly and explain everything well. very convenient payment options. the hours are also a plus. open when you need to get in your unit. recommend them!! We worked with Brittany who was so friendly and helpful! She answered all of our questions! Our storage space is so easy to access, is spacious and is clean! We love that there is a gate with a key code to get in for added security! overall, the prices are great and afforadable yes! Very clean unit & easy access. Britney at the office was very helpful. This type of customer service is hard to come by and we appreciate all she did for us. Everything is great. The only thing I would change is make our stuff accessible 24 hours a day. The facility is in a convenient & secure location. We received a good deal on a unit that fit our needs. However, after renting a unit for only 4 months, our monthly rental fee has already been increased by $6 a month, which was very frustrating. Excellent pricing but rates go up to often. The facilities are clean and convenient. Personnel are very helpful. We have had no problems with the facility. It is clean and is run efficiently for fair prices so meets expectaitons. Drive southeast on Preston Hwy. Pass Louisville Male High School and continue straight on Preston Hwy. Our facility is on your right, just beyond Sam’s Club. Drive north on Preston Hwy. Pass Southern High School and continue straight on Preston Hwy. Pass the Preston Park Shopping Center and continue straight on Preston Hwy over the train tracks. Our facility is on your left, before Old Fern Valley Rd. Drive west on Fern Valley Rd. Turn left onto Old Fern Valley Rd. Turn left onto Preston Hwy. Our facility is immediately on your right, next to Sam’s Club. Drive north on Grade Ln. Turn right onto Fern Valley Rd and pass Louisville International Airport. Turn right onto Preston Hwy. Our facility is on your right, just after Sam’s Club.